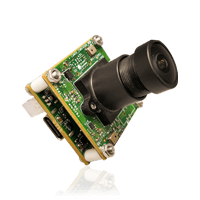 Conversa is a 3.4 MP UVC and UAC compliant USB 3.1 Gen 1 camera board based on AR0330 sensor from ON Semiconductor®. This Low Light USB Camera contains a dual PDM microphone which provides the stereo audio recording capability. As the name implies, Conversa is ideal for customer applications such as indoor and outdoor video conference, doorbell camera, in-vehicle surveillance, action camera to record both audio and video during movement, rescue AGV and so on.